We have a large, light and airy reception area which ensures you can speak to one of our reception team in comfort. This practice has a large dog waiting area with lots of comfy seating available. 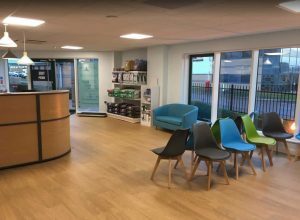 We know just how important it is to reduce stress during visits to our practice – especially for our smaller patients, and so we have a lovely separate waiting area for our cats and rabbits away from the sight and sound of any dogs. As parents; Lloyd and I know that sometimes you need somewhere to occupy your children! So we have provided a small play area to help keep them busy whilst at the practice. Our cat and rabbit waiting area leads straight into 2 cat consulting rooms ensuring your smaller pets have as pleasant a visit as possible. We have 4 consulting rooms in which we can see our canine patients in comfort. We have a lovely quiet room at our Walter Leigh Way site, designed to be a relaxing, quiet space which is available for those wishing to visit their pets should they need to stay with us overnight. We have dedicated this room to Sushi – a much loved and never forgotten patient who is sadly no longer with us. We have 3 sterile theatres within our WLW practice along with a large treatment and preparation area. This allows us to provide excellent operating facilities for both routine and non routine surgical cases, along with major orthopaedic surgeries. Our spacious dental suite is equipped to perform dental procedures on dogs cats and rabbits. We are proud to boast a fantastic digital xray machine which allows us to take images of your pets and obtain the results rapidly should the need arise. Should your pet need to stay with us for the day or even overnight you can rest assured that their comfort is our priority along with their medical needs. We have dedicated dog, cat and rabbit/small animal kennels which means that different species are kept away from the sight, sound and smell of other species. This helps reduce stress levels in our inpatients. We use species specific pheromones in our dog and cat wards to further help reduce stress – and lots of cuddles of course! Sometimes our patients are suffering from contagious conditions and we are able to care for them in our isolation area, thereby protecting them and our other patients as much as possible. We have in house laboratory facilities which allow us to perform a range of tests including blood and urine tests, within the practice with results being available in as little as 15 minutes. We also have a microscope which plays a critical part in many tests including skin tests. For some, more specialised, tests it may be necessary to send samples to a dedicated animal laboratory. Our practice management system shares information in real time between both our practices. It allows us to keep accurate and up to date records for all your pets and allows us to send you reminders for boosters, health checks and routine parasite control via email or sms. We have a team of vets and nurses available 24 hours a day, 7 days a week, 365 days a year. This means our doors are never closed in case of an emergency and you can be reassured that your pet can be seen by a member of our team in familiar surroundings what ever the time of day or night. As at our Twist Lane practice we have an ultrasound machine at our big sister site. This allows us to carry out simple investigations such as pregnancy diagnosis, to more complex investigations such as ultrasound examinations of the bladder or other abdominal organs.